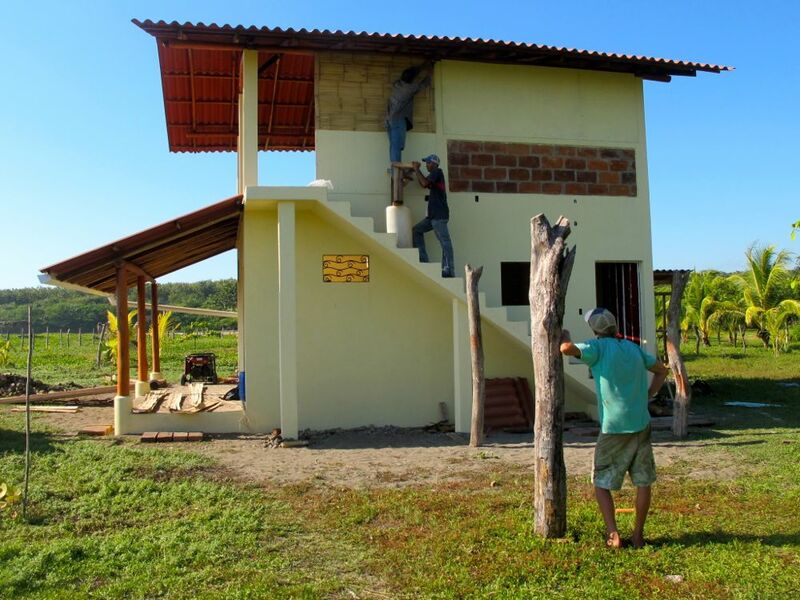 We started building the beach house way back in March – or was it February 2013? The point is, it’s been so long that it’s hard to remember. 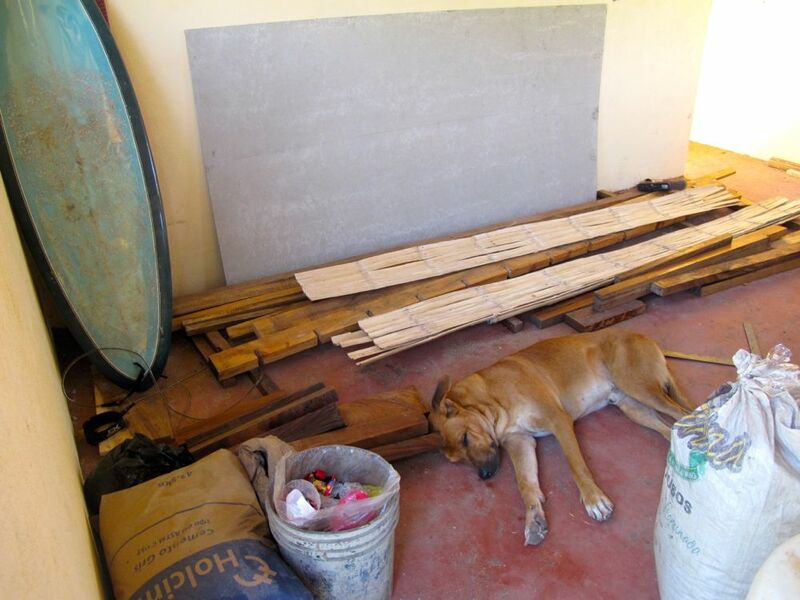 The main delay has been caused by an irresponsible carpenter with a lot of excuses (mostly lies) and a weak work ethic. 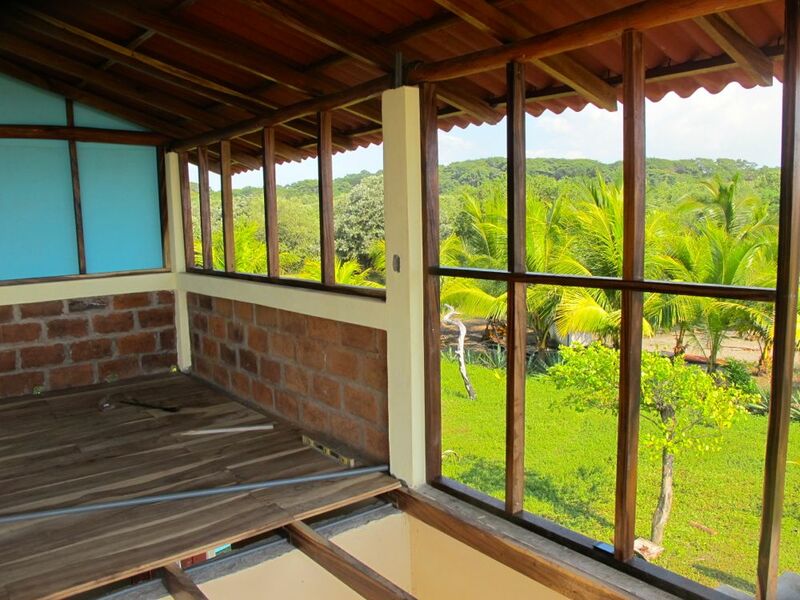 We had been waiting for the guanacaste wood floor to be installed before closing in the upstairs walls, but we could not wait any longer. 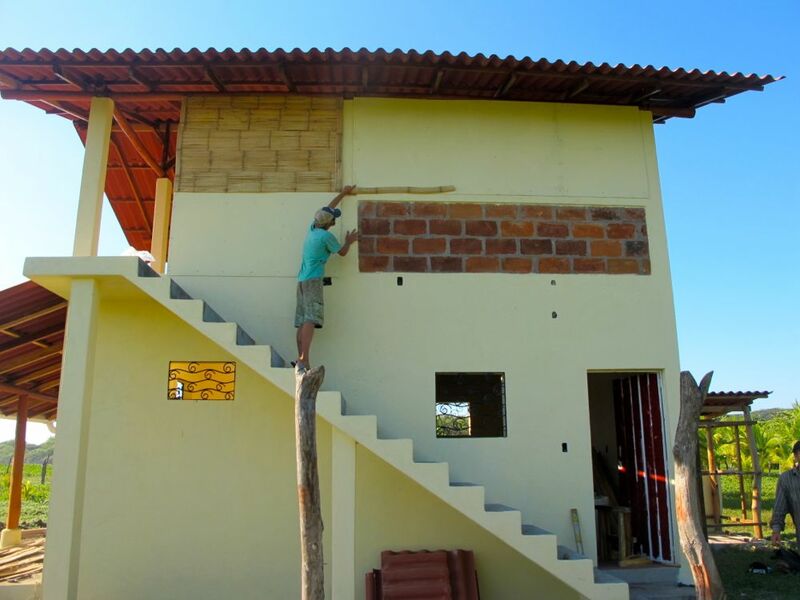 We chose Plycem 1/4″ sheets for the upper walls because they are relatively lightweight, cheap, easily paintable, and waterproof. We wanted to add a little bit of color flair and Kim chose this nice sky blue color, particularly after reading an article that blue light is good for the mind, relaxation and concentration. We were kind of sad to close in the walls and block off this awesome view, but we want to protect the wood floor from the sun and rainstorms that come primarily from the SE direction. Having all blue panels seemed a bit much, so the panels in front are the same color as the house. A nice yellowy sunshine color. You can also see the structure that will be the bathroom in this photo. Kim has always been really excited about bamboo. He finally got a chance to make some esterilla panels. 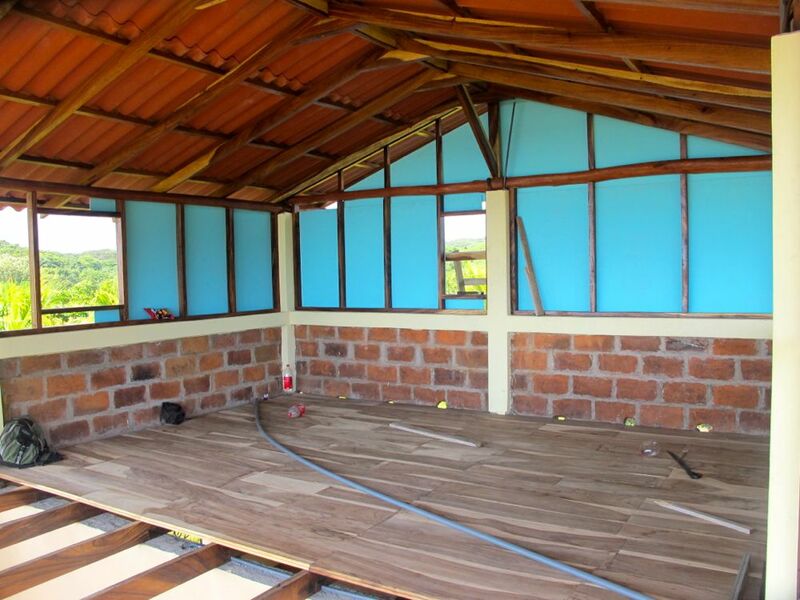 Long bamboo is sliced with an axe or machete so that it can be flattened out and then used as a panel that will let in light and air but block most of the rain and sun. The local building crew had never seen it before and were really impressed. 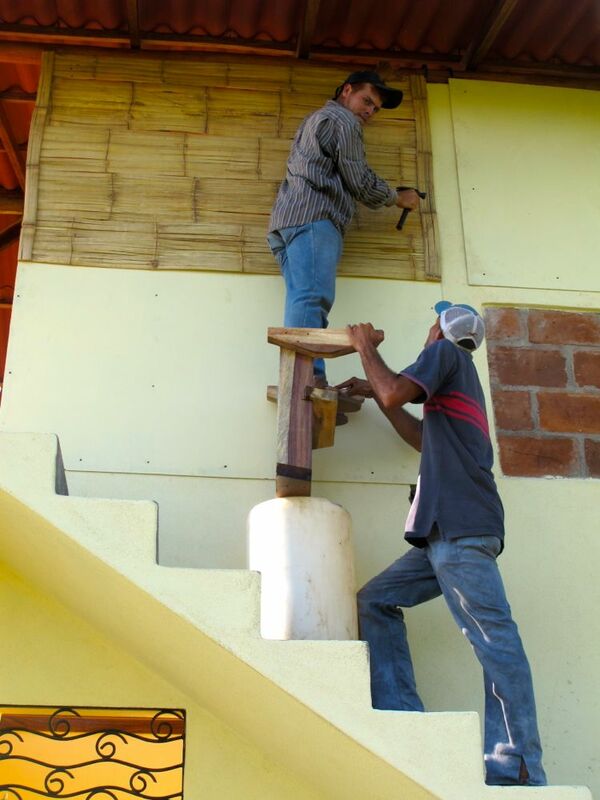 This ladder technique would not be approved of by OSHA. It was sketchy, but they got it done! Lobo takes a nap on the cool cement floor inside. 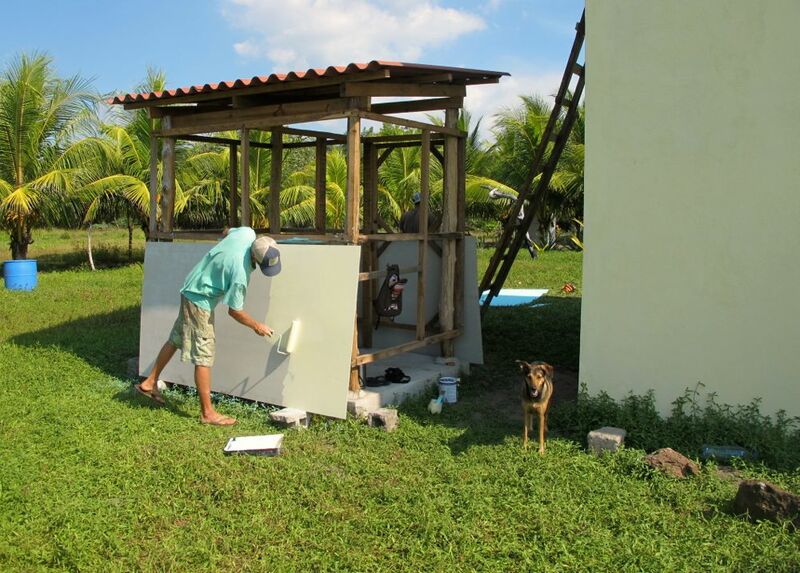 You can see the flattened bamboo panels ready for use and an un-painted plycem panel. Still to come…. building a rack for all the surfboards! 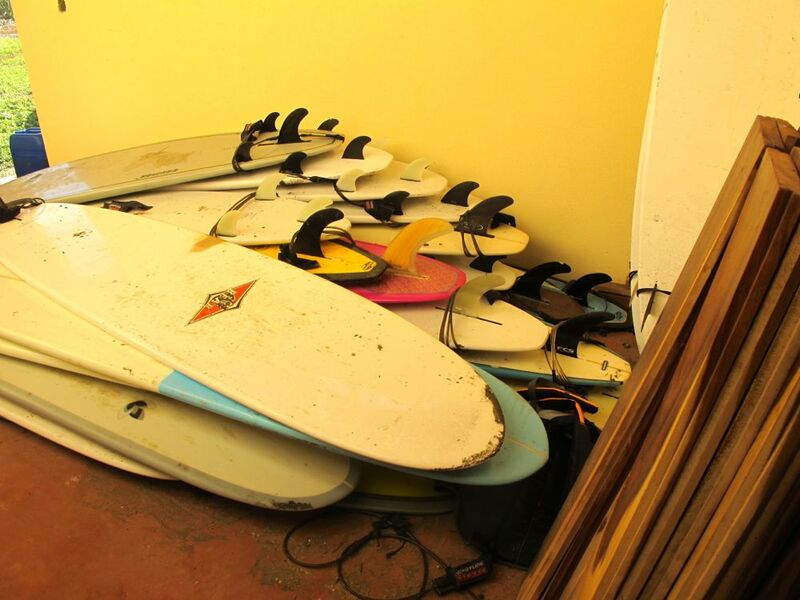 The house is being used as surfboard storage for our Surf With Amigas womens surf yoga retreat business and we have a large selection of boards. We are also hoping to have the floor finished one day very soon. Still waiting…. 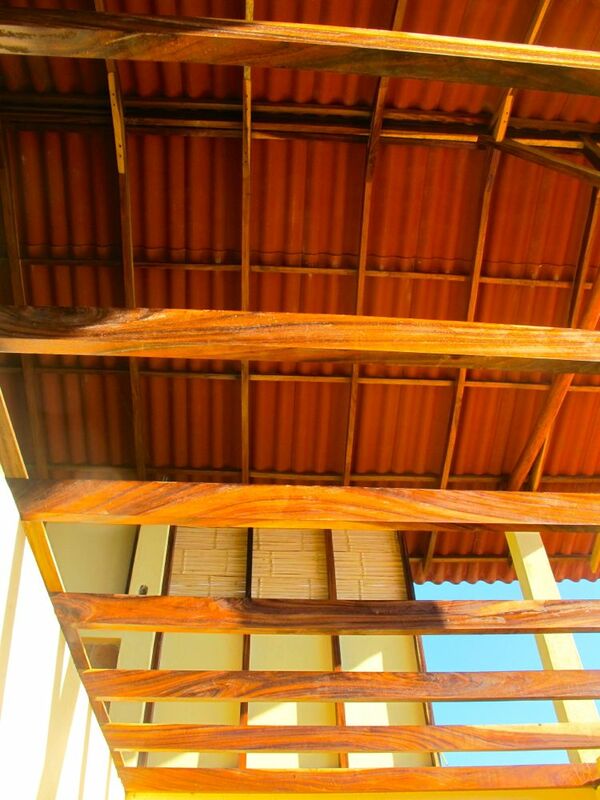 This photo shows off the Nicalit roof supported by guanacaste beams, and the inside of the bamboo panel. I really like the ease of using the plycem panels but don’t love the look of the screw holes and how the panels connect with the cement. We are considering using strips of the bamboo to frame the panels. Here Kim holds up a test piece. What do you think? 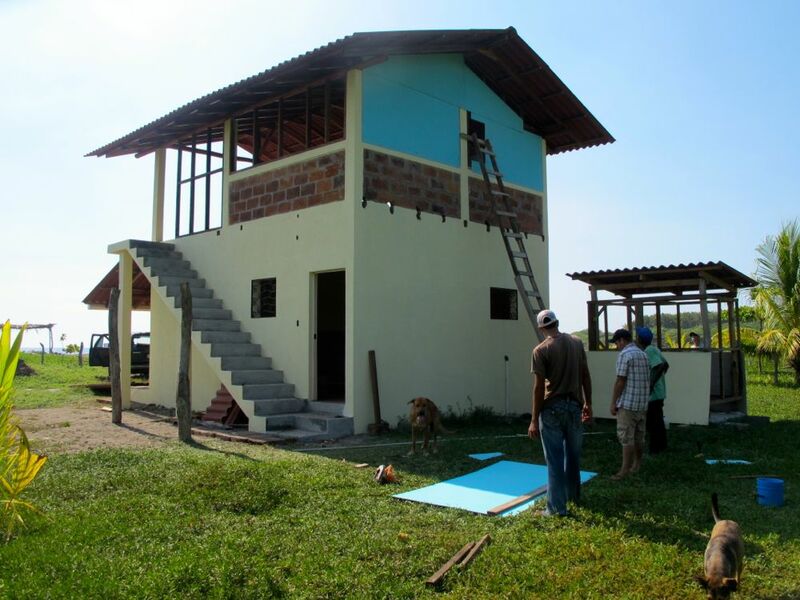 This entry was posted in Building in Nicaragua, Green Building and Bamboo, Nicaragua and tagged bamboo construction, bamboo esterilla, beach house, brick, building, building a house, hipehabitat, holly beck, kim obermeyer, nicaragua, northern nicaragua, plycem. Bookmark the permalink. Holly and Kim…Congratulations on the progress! Really taking shape, I especially like the flooring upstairs and the little iron work detail under the stairs. Nice work! The bamboo definitely gives it a tropics aesthetic. You guys are so good at working with what you have. The place is coming together.